What can a Producer do to Improve Revenue? This blog has now received over 100,000 reads, which is well above the initial goals. One question that has been asked frequently is "What should a producer do to improve revenue?" Producers always have a keen eye on costs, but the mathematical complexities of the revenue line often seem daunting. Hopefully, some of the content posted on this blog has been helpful in demystifying the milk payment process. This post will focus on one particular technique that can help build revenue. One of the trends in dairy is a significant shift in the usage of milk. Turning the calendar back a few decades, the U.S. dairy business was characterized as a lot of small producers making milk for full fat fluid milk, consumed within the U.S. Typically, production, processing, and consumption all occurred within a 100 mile radius. Between then and now, the nature of dairy consumption has changed significantly. Per capita consumption of fluid milk has dropped drastically. The fluid milk that is consumed is mostly reduced fat milk. Today, the leader is 2% fat milk and the trends indicate that within a few years, the leader will be 1% fat milk. There is also a growing practice of adding nonfat dry milk to bring the solids back to the original level when fat is removed. 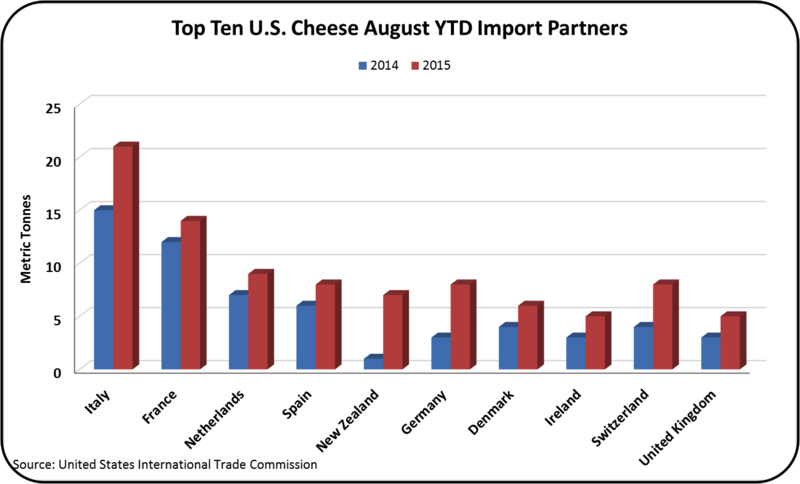 Cheese consumption continues to grow at a rate around 2% per year. Other products, like yogurt, are growing significantly. 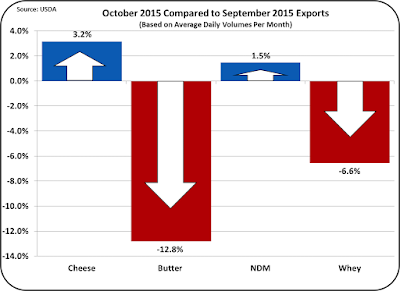 An additional big change has been the growth in exports. They have grown from just a few percent to as high as 16% of milk solids produced. Within a few years this could easily grow to 20%. What all these trends share is an emphasis on milk solids. Cheese requires a specific ratio of protein and fat to allow economic production. This frequently requires boosting protein levels with nonfat dry milk or other protein concentrates. The growing category of Greek yogurt requires high levels of protein. Exports are nearly 100% solids, as shipping water internationally is cost prohibitive. 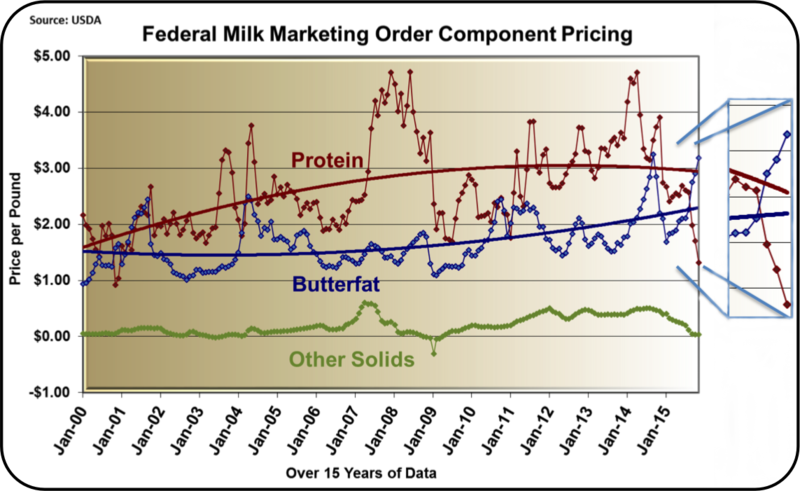 To match the changes in milk, the growth in milk production has occurred primarily in the Federal Milk Marketing Orders paid on components. California producers may soon join Federal Order component payment processes. One of the techniques for improving component levels is balancing amino acids in feed to match the cow's needs for efficient production of components. This practice is largely accepted in areas like Wisconsin. Nutritional needs including amino acids can be identified in new nutritional software programs that have been developed and refined over the last decade. Production of rumen-protected amino acids has increased availability of quality products. Amino acid balancing has been commonplace in poultry diets for at least 50 years, but developing the supplemental amino acids with coatings to protect them in the rumen has taken a lot of talented people quite a long time to accomplish. Today, there are many products that meet these requirements. One of the tools for financially evaluating the benefits of amino acid balancing is the companion site to this blog. The evaluation tool is available at milkpay.com. It is also available as an app for smartphones and tablets under the name "milkpay." The website and the apps are updated monthly for current component prices and the current Producer Price Differentials. There is also growing technical support from nutritionists and consultants who have gained significant real world experience in balancing amino acids. I would suggest contacting Dr. Brian Sloan, Dr. Chuck Schwab, Dr. Daniel Luchini, or Dr. Shane Fredin for assistance in identifying the professionals available in your location. 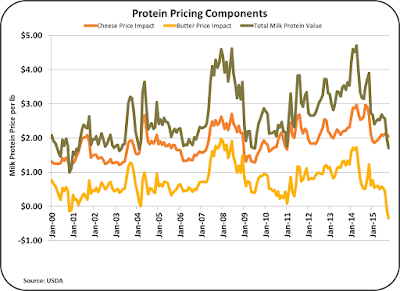 The U.S. producer milk prices are determined by formulas, which are based on the wholesale prices of cheese, butter, dry whey, and nonfat dry milk as determined by NASS. Supply and demand and the resulting inventory levels influence the prices of these commodities. Changes in supply move slowly, as changes in herd sizes, processing plants, and overall productivity take time. Changes in domestic consumption also change slowly and are predictable. Per capita consumption of cheese is growing as it has for decades, and per capita consumption of milk is decreasing and changing to lower fat formats. The most volatile sector on the demand side is exports and imports. Over the last five years, exports have been in the range of 12% to 18% of production and have shown growth, until now. On a monthly basis, during the 12 month span of early 2014 to early 2015, exports dropped from 18% to less than 12% of U.S. milk solids production. Currently exports are at a 15% level. 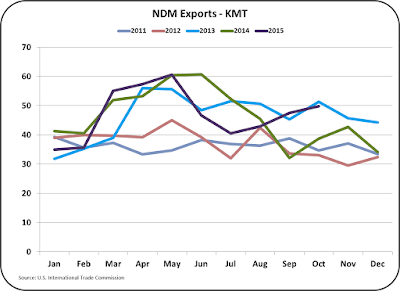 The volatility in exports, and to a lesser extent, imports, is driving the dairy commodity market and producer milk prices. 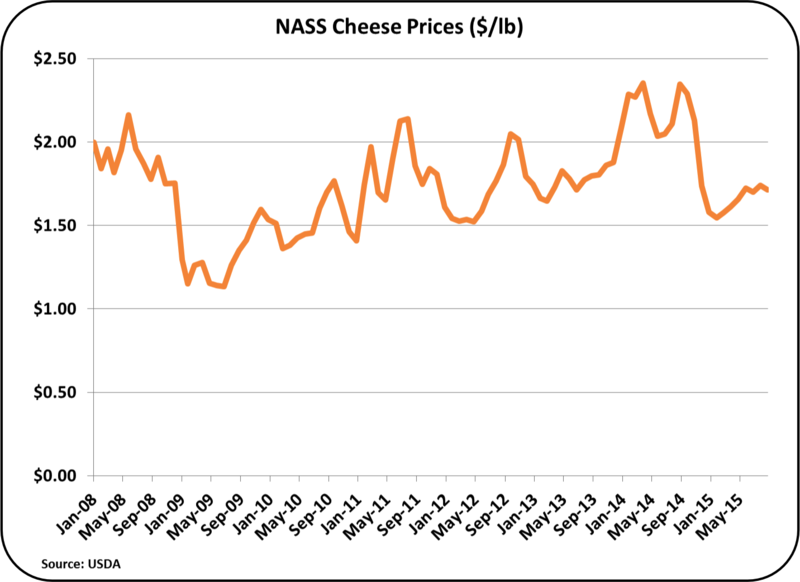 By the Federal Milk Marketing Order formulas, the most important determinant of producer milk pricing is the NASS wholesale cheese price. 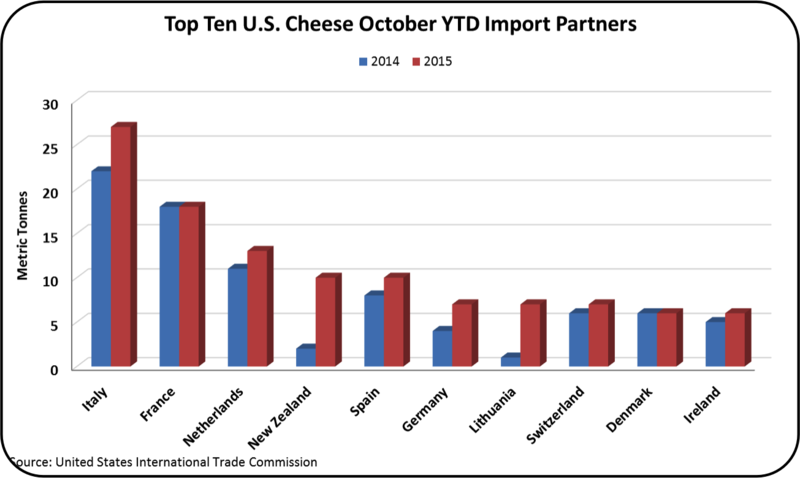 Cheese inventories are rising as exports fall and imports rise. Rising inventories typically result in lower prices. 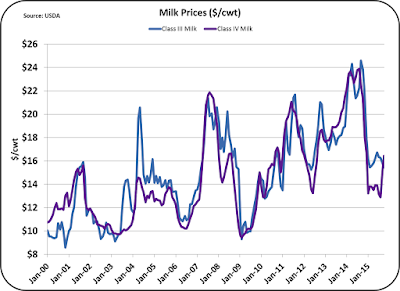 This dynamic is really the key analytic as to what is driving the Class III milk price. Below are the month-to-month changes in exports and imports of the commodities used to price milk. Butter is the most dynamic change on a percentage basis. Because butter dynamics were covered in the prior post, butter analytics will not be covered in this post. 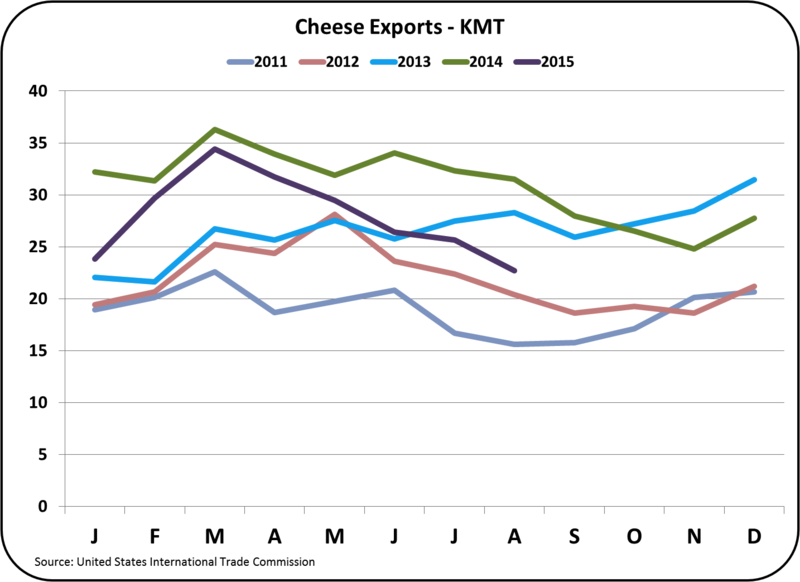 Cheese exports and imports showed the lowest percent variation, but those statistics are comparing a disappointing month to a prior disappointing month. 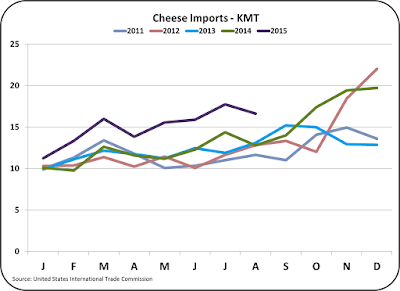 Cheese exports and imports will be the examined in this post. 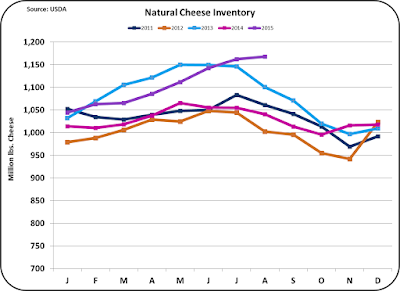 Domestic U.S. cheese inventories are growing as shown in the two charts below. 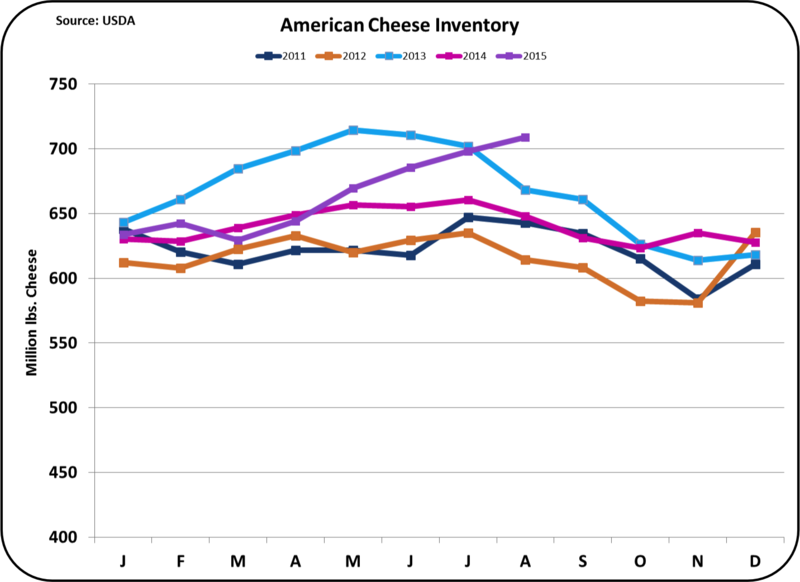 If they continue to grow, wholesale cheese prices are bound to fall. Cheese production is up 2.5% and domestic consumption is up 3.0%, so the growth in inventories has no basis in domestic dynamics. The growth in inventories has everything to do with global dairy dynamics and and their impact on exports and imports. 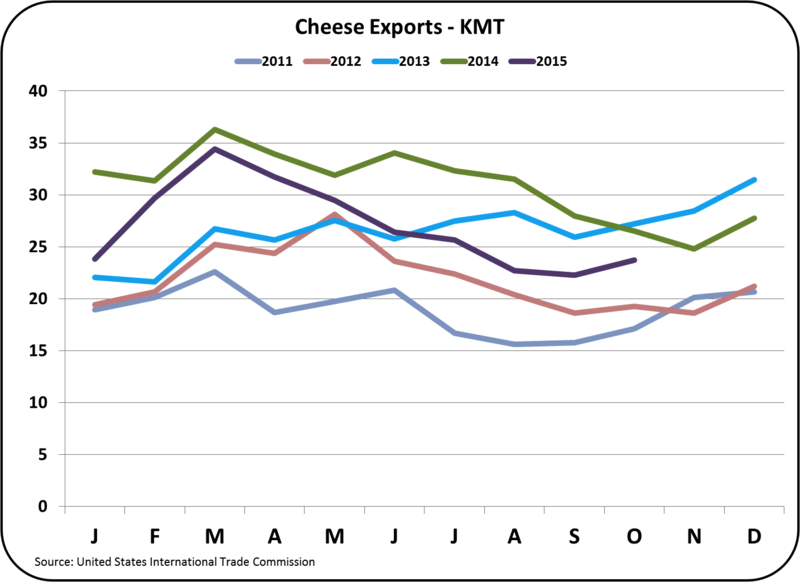 Cheese exports, as shown below are well below the prior two years. While Mexico has always been the primary market for U.S. cheese exports, the next two largest importers, South Korea and Japan, have found new sources, primarily from New Zealand. 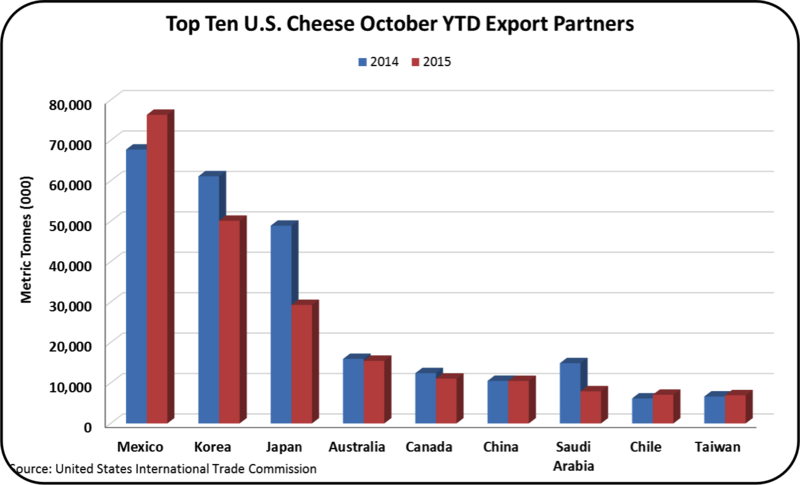 Below is a comparison of 2014 and 2015 cheese exports for the U.S. largest customers. Imports were down slightly in September from the prior month. However, they are still at a record high for the month. 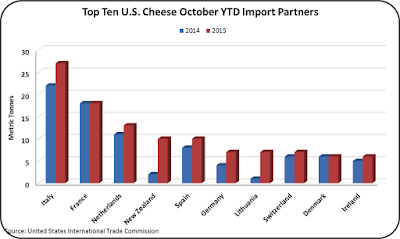 Cheese imports are coming from many countries. The majority of imports are from Europe and more recently, New Zealand. Why are these imports available? Russia is still holding to its embargo of European dairy products so there is an excess in Europe that needs a home. 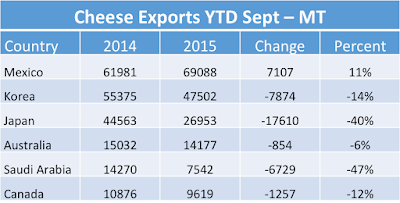 New Zealand was exporting significant amounts of cheese to China. The partial collapse of that market has left New Zealand with excesses it has to deal with. 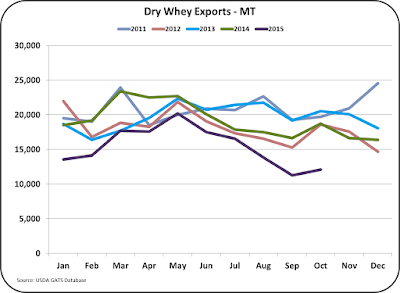 One other event impacting producer milk prices is the collapse of the dry sweet whey market. Dry sweet whey is the basis for the pricing of "other solids" in the component payment system. Other solids were contributing around $2.50/cwt. to the Class III milk price. In October, the contribution was $.19/cwt. Dry sweet whey is a co-product of cheese manufacturing. As cheese manufacturing increases, the availability of sweet whey also increases. 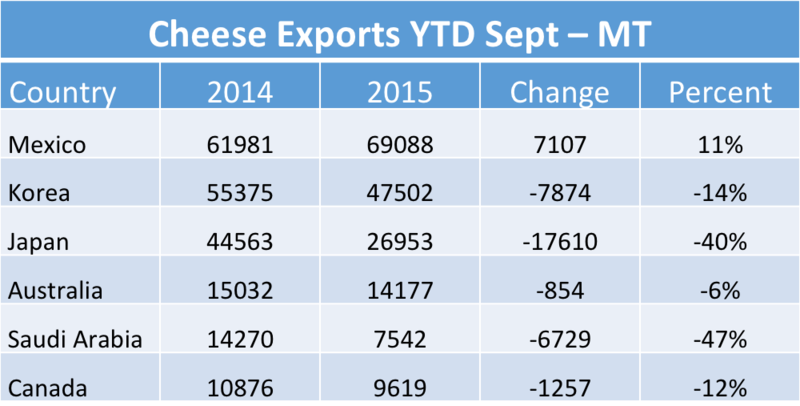 The sale of dry whey is very dependent on the export market with 43% being exported YTD through September. 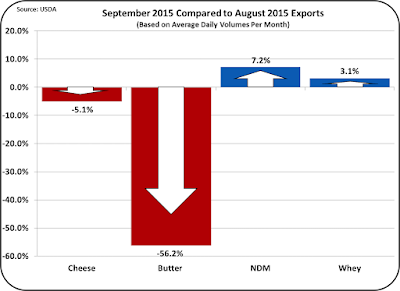 However, these exports are falling and September exports were approximately half of the mid 2014 export level. Dry sweet whey is an excellent product with a dairy smell and taste. It contains lactose, whey proteins, minerals and vitamins. Production of American cheese is the primary domestic use of sweet whey today, but other uses as an ingredient are constantly being studied. It is impossible to determine when the dry sweet whey market will recover, but for now, the lack of demand and resulting low price is a significant negative impact on the Class III price. 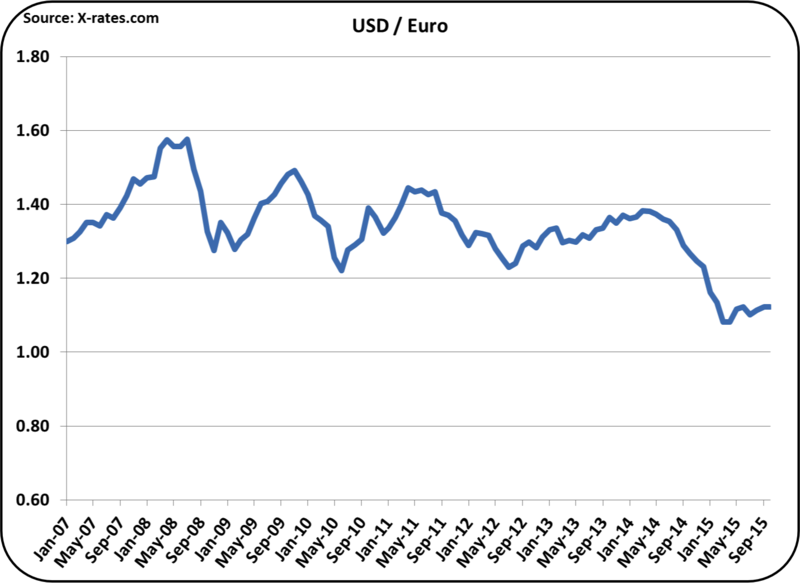 Exchange rates do play a significant roll in making U.S. products competitive in the global market. The excellent recovery of the U.S. economy has a dark side. A strong USD makes U.S. manufactured products more expensive in the global arena. With the potential FED increase in rates in December, the USD may strengthen further. 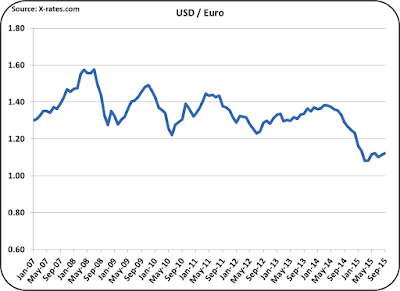 The conversion rates for the USD/Euro are shown in the chart below. 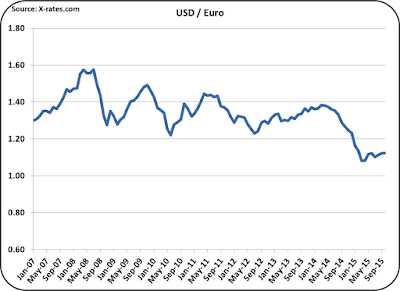 While the exchange rates with the Euro has stabilized, the USD is still strong by historical standards. Looking at the USD/NZD chart below, one is reminded of the 2008/09 swings from $20/cwt. milk prices to $10/cwt. milk prices. 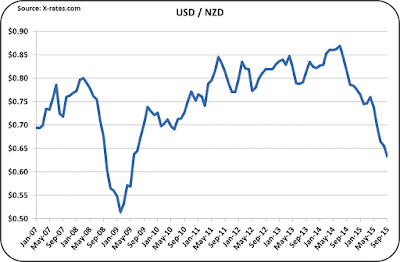 In 2008, the NZD was relatively strong and U.S. exports boomed. 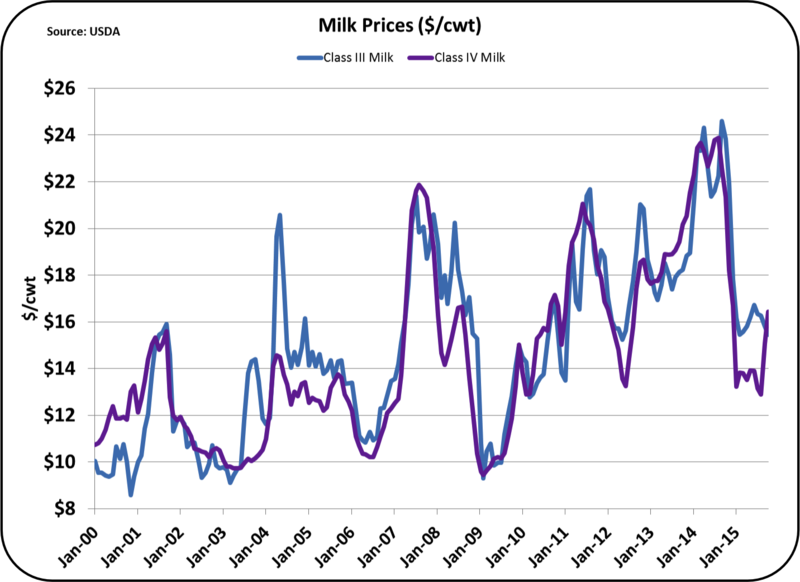 In 2009, there was a total reversal and milk producer prices dropped to $10/cwt. As we look at the right side of the chart, we see a similar scenario building. 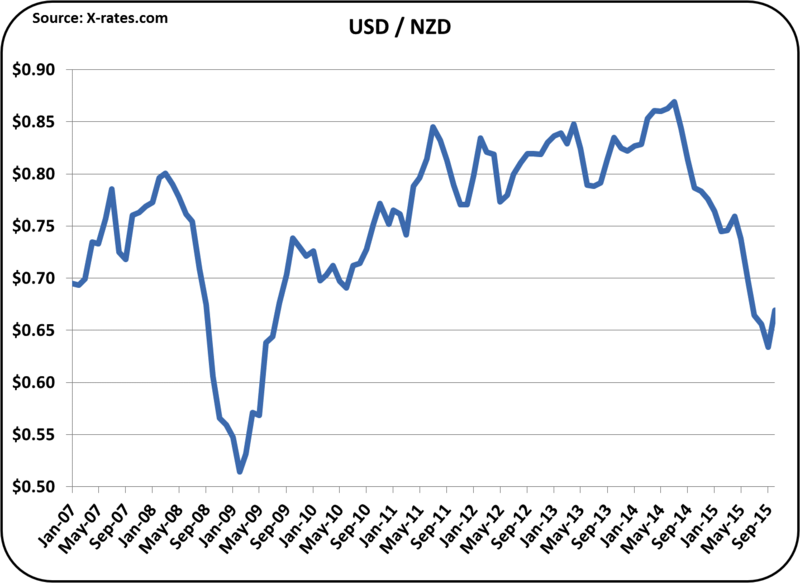 In October, the NZD did show some slight strengthening. U.S. dairy exports/imports and global dairy dynamics are currently the main driver of U.S. producer milk prices. Future posts will continue to follow these international dynamics. 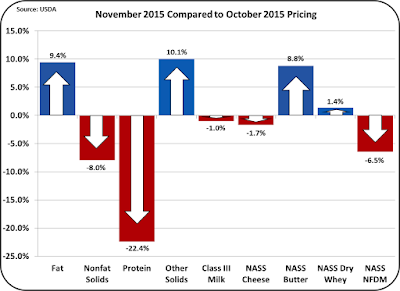 One November 2, 2015, Class and component prices were announced for October. 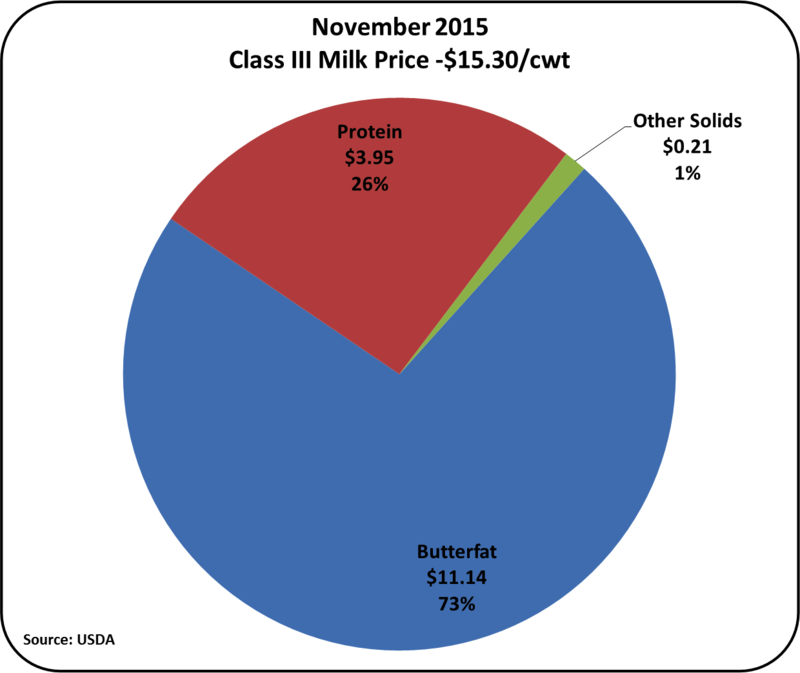 The Class III price was down slightly at $15.46/cwt. compared to $15.82/cwt. the prior month. The butterfat price was again up, reaching the second highest price ever. 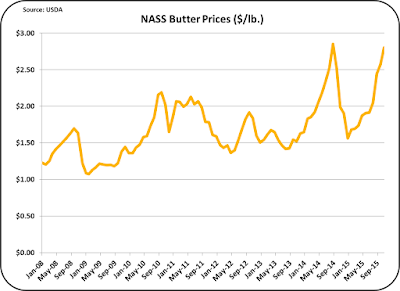 The U.S. NASS price for butter is approximately twice the global price. With dairy evolving into an international market, sustaining the high U.S. butter price will likely be short lived. Other solids have become essentially worthless at $.03/lb. This is the lowest price in six years. The pie chart shown below is significantly skewed from historical proportions. Two thirds of the Class III price is now being contributed from payment for butterfat. Unfortunately, a high butter price has very little impact on the Class III price overall, and only shifts money from protein to butter. More on this below. The long-term trend chart is shown below. While butterfat is typically worth much less than protein, butterfat currently is valued at $2.91/lb. while protein is valued at $1.70/lb. Driving these unusual prices is what can best be described as a bubble market price for butter. The CME futures market is projecting a price decline of 25% by year end. 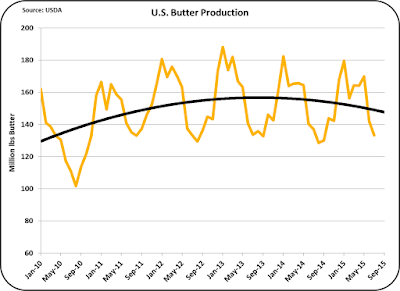 Butter churning is continuing to decline at a time when butter consumption is up. 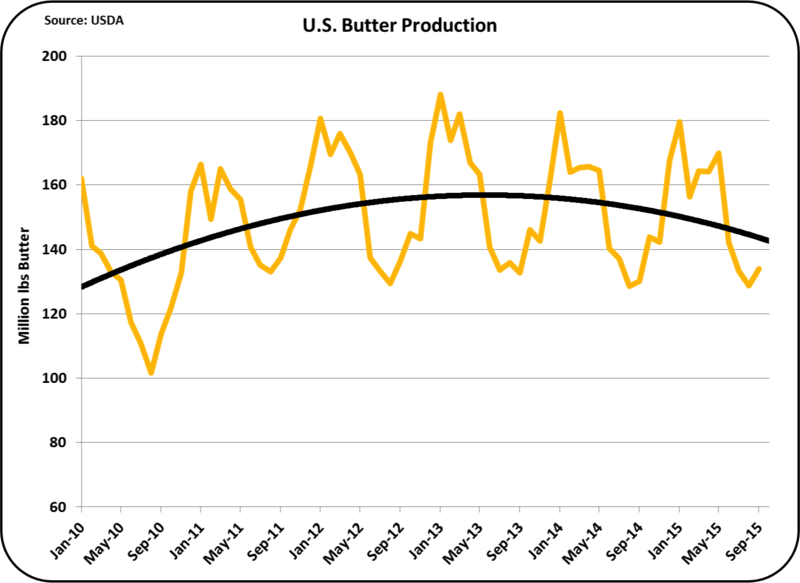 The chart below indicates about a 10% reduction in butter churning over the last three years. 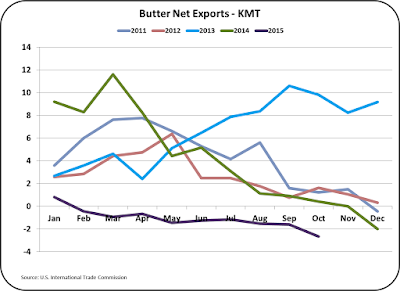 The balance of butter supply is being made up by reduced exports and record imports. 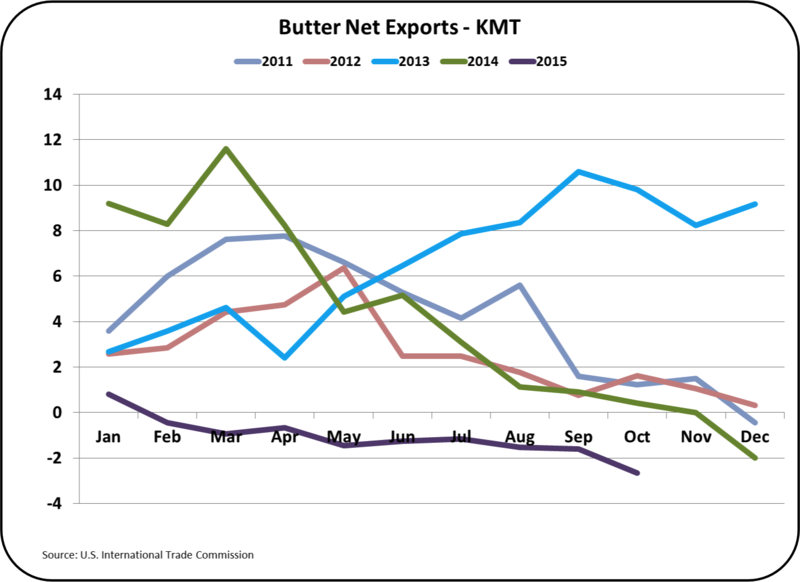 Exports are trending near zero and imports continue to be at record levels, leaving the U.S. as a net butter importer. Dairy imports and exports will be examined in detail in an upcoming post to this blog. 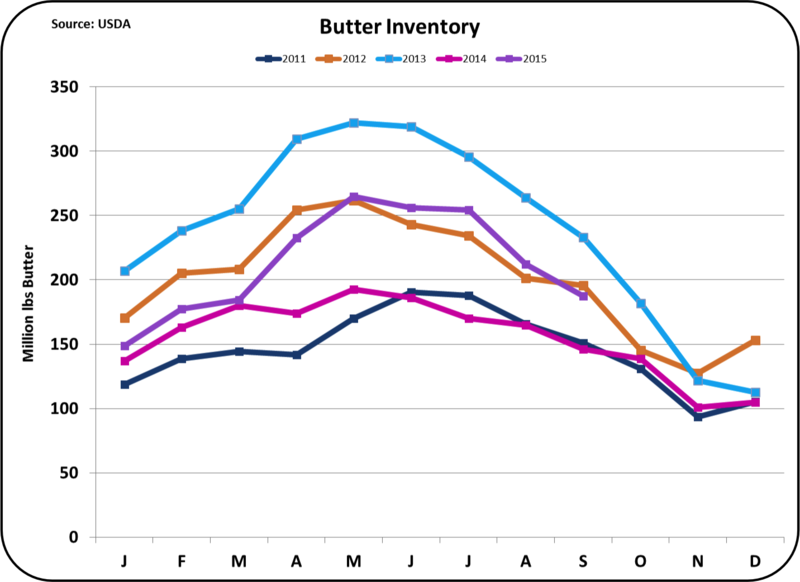 The low production, low exports and record imports of butter have resulted in inventory levels that parallel historic levels. Butter inventories are higher than a year ago and lower than the prior two years. While the pricing of dairy products typically follow the Keynesian economics of supply and demand. That is currently not the case. Inventories can best be expressed as "normal," and the price is at near record highs. The price of milk protein is calculated by a slightly complex formula involving the wholesale price of cheese and butter. Because milk protein is essential to economical production of cheese, the milk protein price is tightly tied to the NASS price for cheese. However, butterfat in cheese is typically worth more when used in cheese rather than butter, and that extra value is given to the calculated value of milk protein. While the formula remains the same, currently the part of the formula involving butterfat has gone negative. One more factor that is currently unusual is the pricing of Class I milk. The price of Class I milk is based on the higher of the Class III or Class IV advanced price. What impact does this have? For those paid on the Federal Milk Marketing Order advanced system, this is a very positive event. It improves the price of Class I milk and most milk paid on the advanced system is Class I milk. For those paid on the component system, the higher Class I price will have a positive impact of the Producer Price Differential. What does all this mean for dairy producer milk prices? 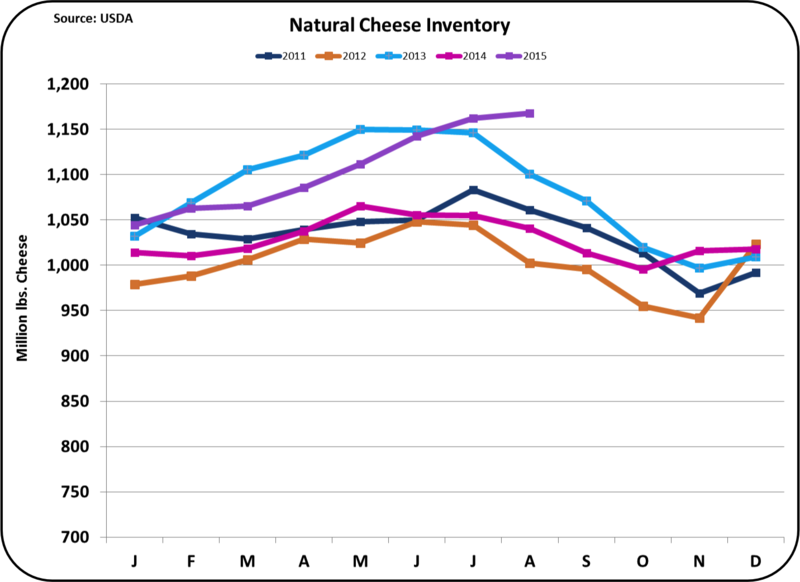 Because cheese prices have little reason to change in the near future, little change is anticipated in the Class III price. 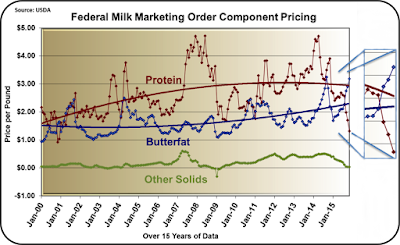 However, the bursting of the butter bubble will shift the payment to higher pay for milk protein and lower pay for butterfat. This represents a change to more normal prices which means that producer revenue can best be increased by increasing protein production as much as possible. Exports continue to have a major impact and will be reviewed in the next post. 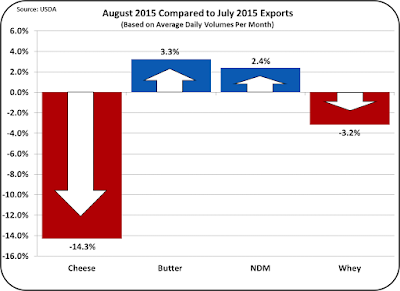 The August dairy export data showed what was expected - lower exports. 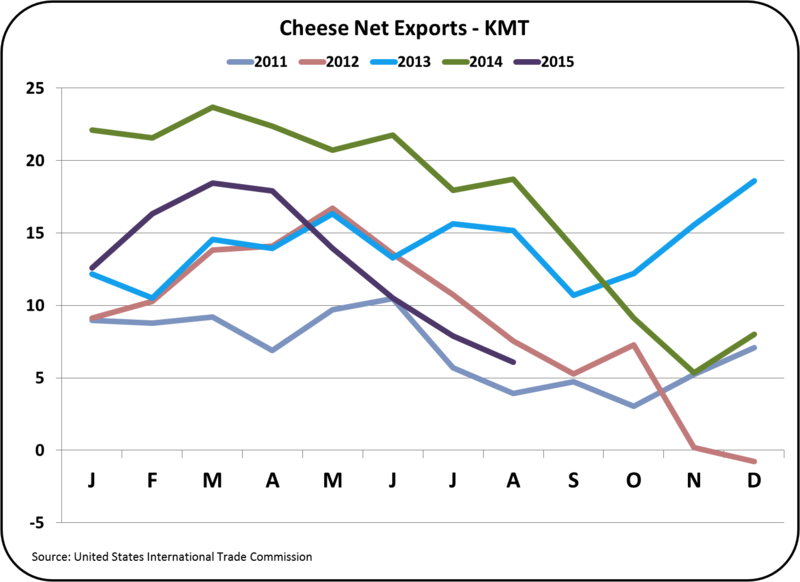 Especially important was the huge drop in cheese exports, down 14.3% vs. the prior month and down 28% vs. the same month in 2014. This is very important because U.S. dairy prices are closely linked to cheese prices. Inventories of natural cheese and American cheese are ballooning as analyzed in the prior post and will negatively impact U.S. wholesale cheese prices. 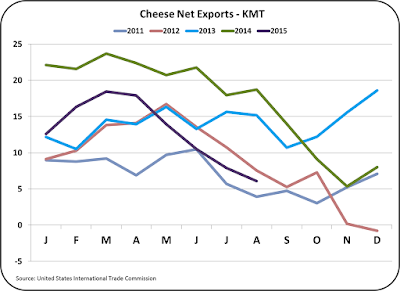 While imports of cheese were down as shown in the chart below, that change did not come close to offsetting the drop in cheese exports. 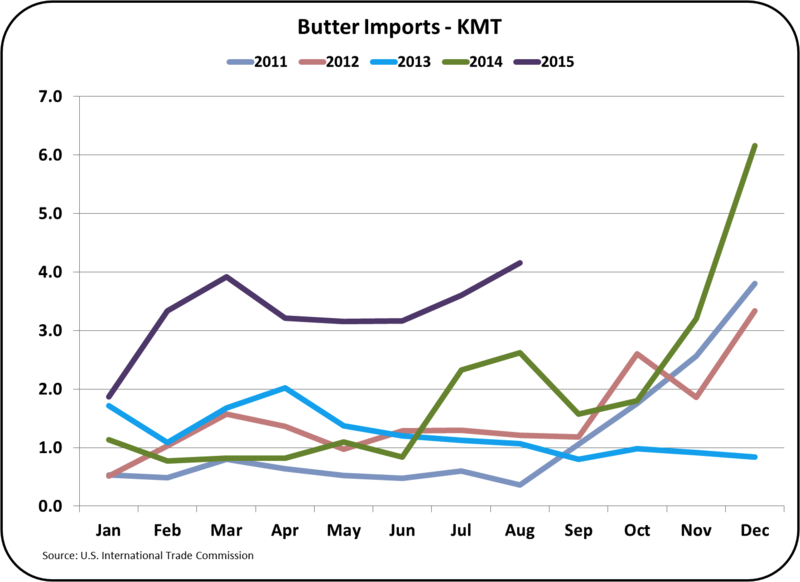 Butter imports were up again. 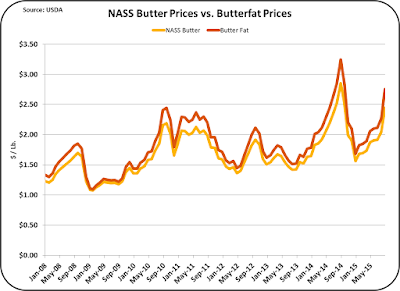 The prior post provides details on what appears to be a building bubble in butter pricing. In the chart below, year-by-year comparative levels of cheese exports are graphed. A strong downward trend has been established over the last six months. This will likely continue as the factors causing the decline are still in place. 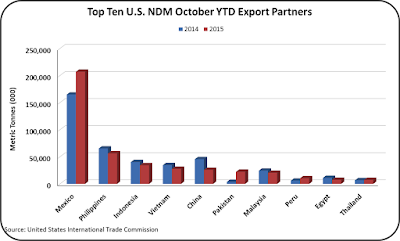 Most of the losses come from the three biggest export customers, Mexico, South Korea, and Japan. 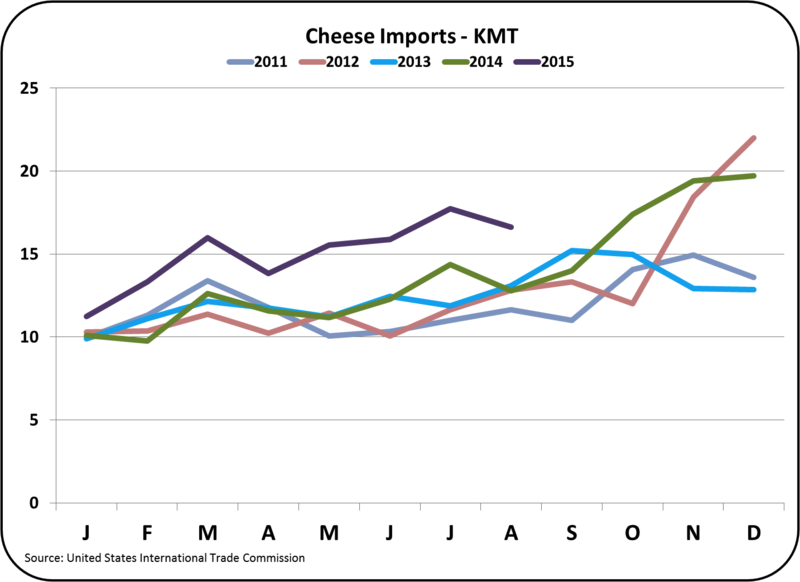 Cheese imports, although less than the prior month, are still way above historical levels. Cheese processors are discovering more low cost sources of cheese and are taking advantage of them. Where are these imports coming from? They're coming from everywhere as many sources offer lower cost alternatives. The major growing import country is New Zealand. Taking advantage of import opportunities is how a capitalistic society works. With 17 KMT of cheese imported in August and 23 KMT exported, the net exports amounted to only 6 KMT. This has erased the progress made in the prior four years. 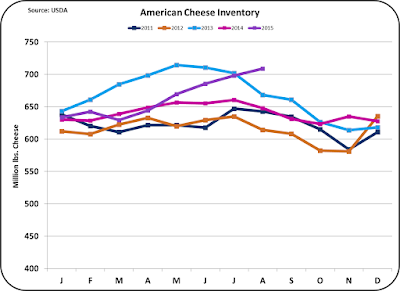 As shown in the prior post, cheese inventories are on the rise as cheese production outstrips demand. The butter price was described in the prior post as a bubble. Will the bubble burst? 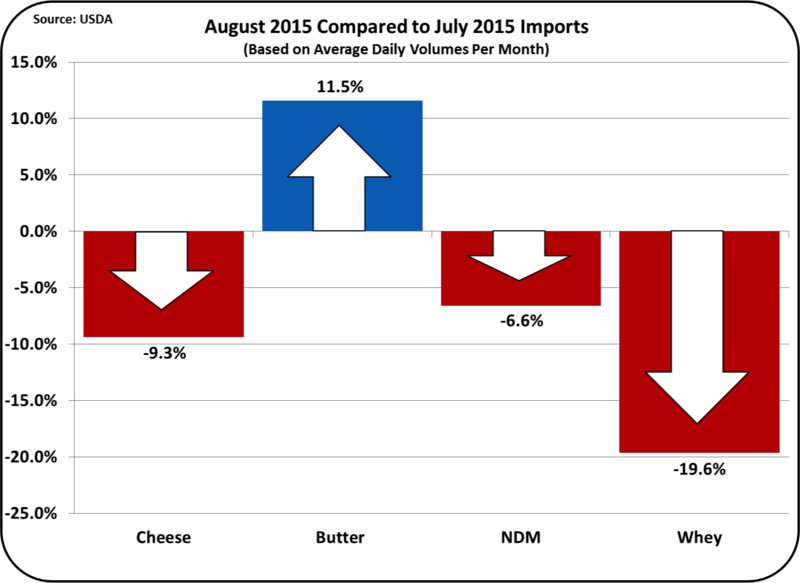 In August, butter imports increased 11.5%. 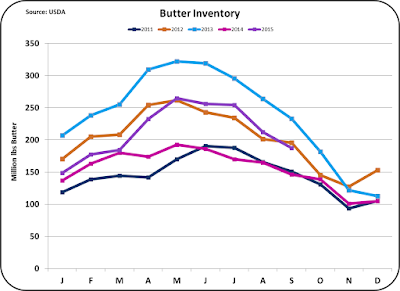 Butter inventories have remained stable as reviewed in the prior post. 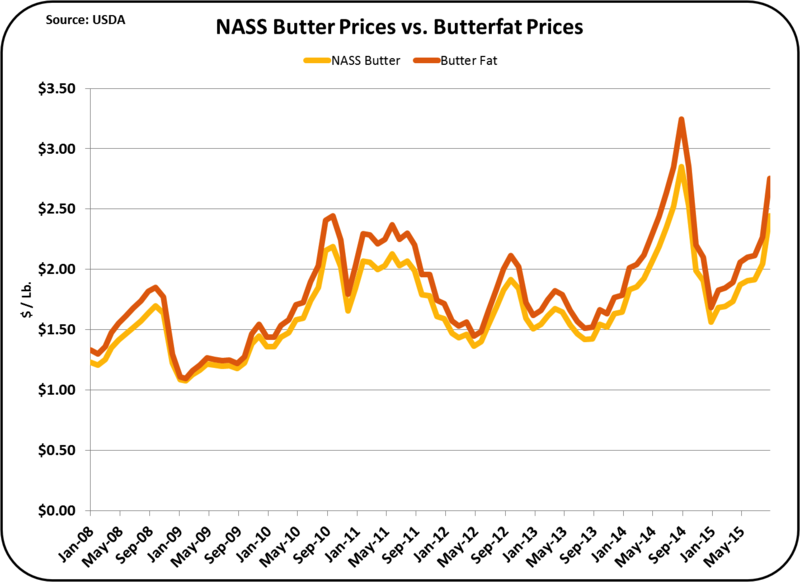 Bubbles occur when there is a basic change in how the industry conducts business and this is the case for butter. 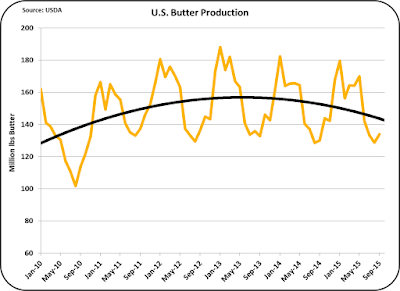 Butter churning has been decreasing for the last three years after decades of growth. Exports are almost nonexistent. Butter imports are well above historical levels. 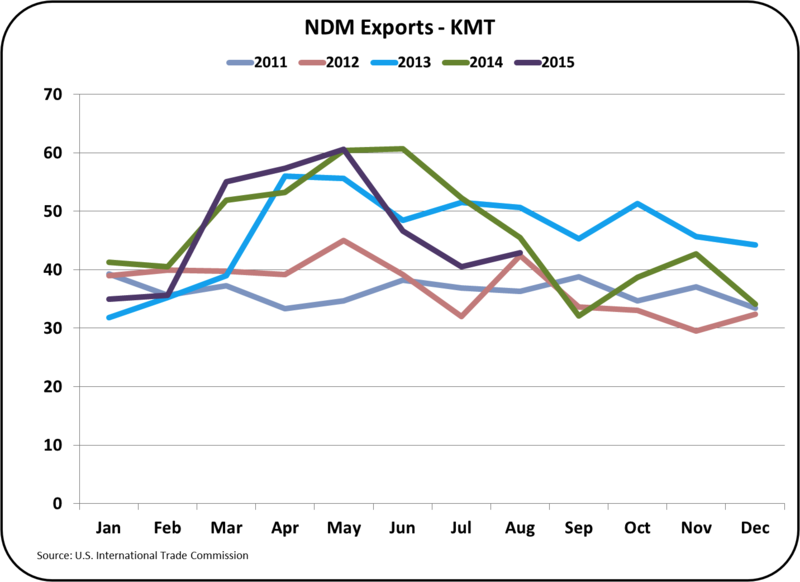 Because consumption is growing, as the U.S. production declines, imports will continue to grow to meet the demand. 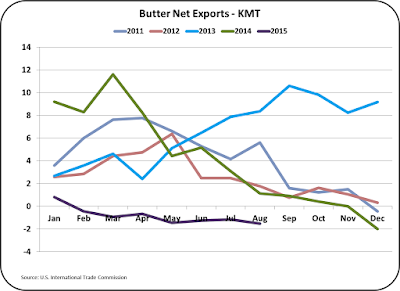 Because butter is much less expensive internationally than in the U.S., if nothing changes, the U.S. butter price bubble will burst. The only question is when. Who is supplying this imported butter? As shown in the chart below, Mexico is the by far the largest source and a new import player. Also, Australia and Canada are new sources. 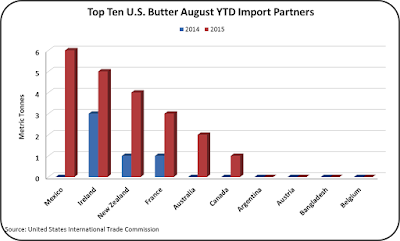 Butter imports from Ireland, New Zealand, and France are not new, but they are significantly expanded. 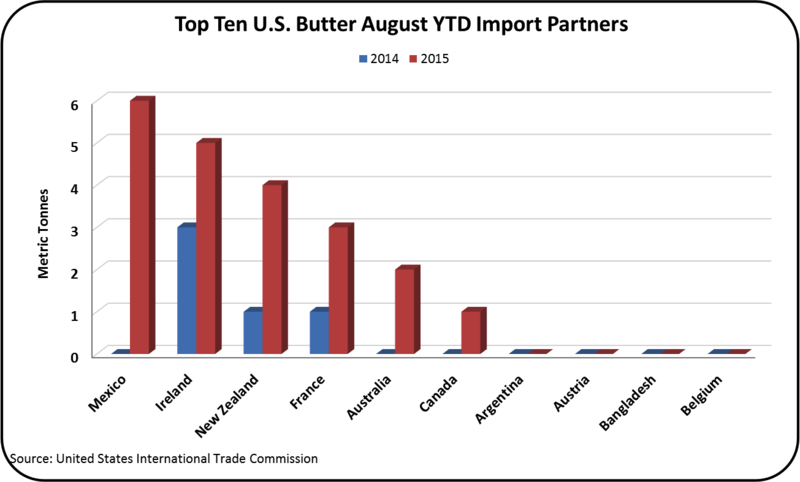 Primarily due to escalating imports, the U.S. is now a net butter importer. The final two commodities that determine milk prices are nonfat dry milk and dry sweet whey. Like cheese and butter, exports of these items are also off. 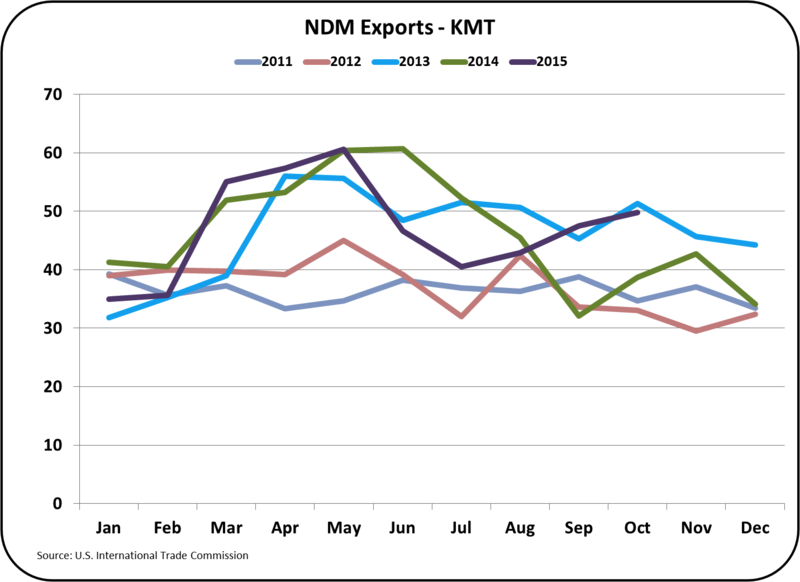 NDM exports did make a slight improvement over the prior month, but YTD exports are off 6%. NDM is the basis for pricing Class IV milk. 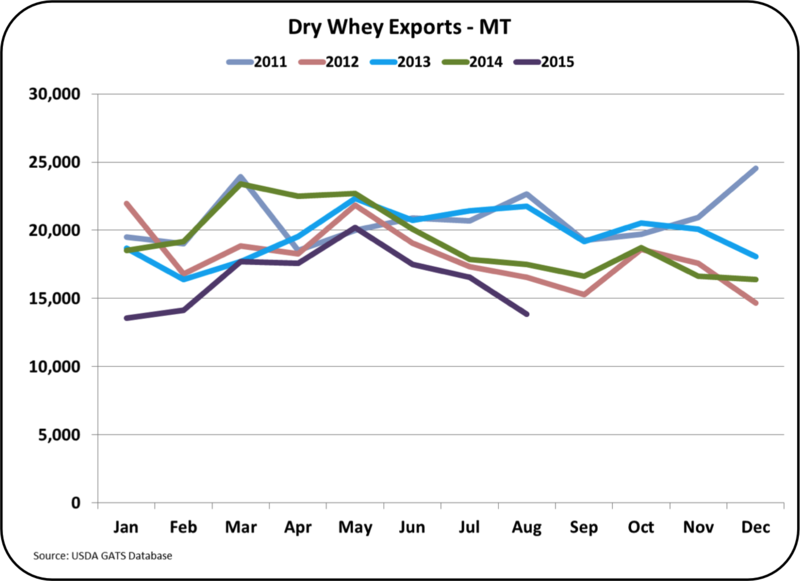 Dry whey exports are off 18% YTD and have been at or below the prior year for all of 2015. 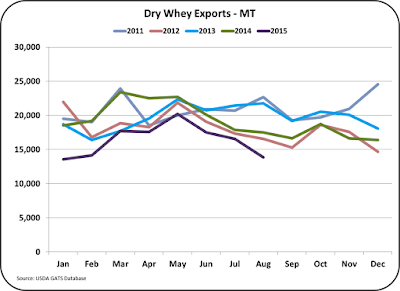 Dry whey is primarily an export item and the lack of exports has reduced the price considerably. 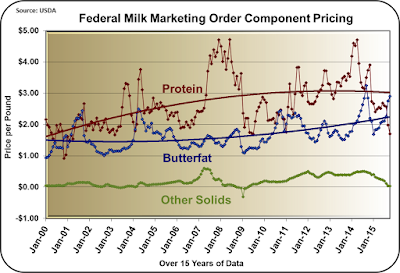 The Dry whey price is the basis for pricing "other solids" in the component pricing Federal Orders. 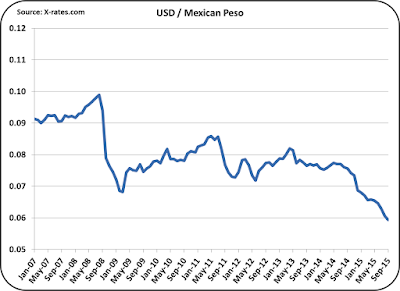 Exchange rates continue to make exports difficult. Europe's economy continues to slowly improve. 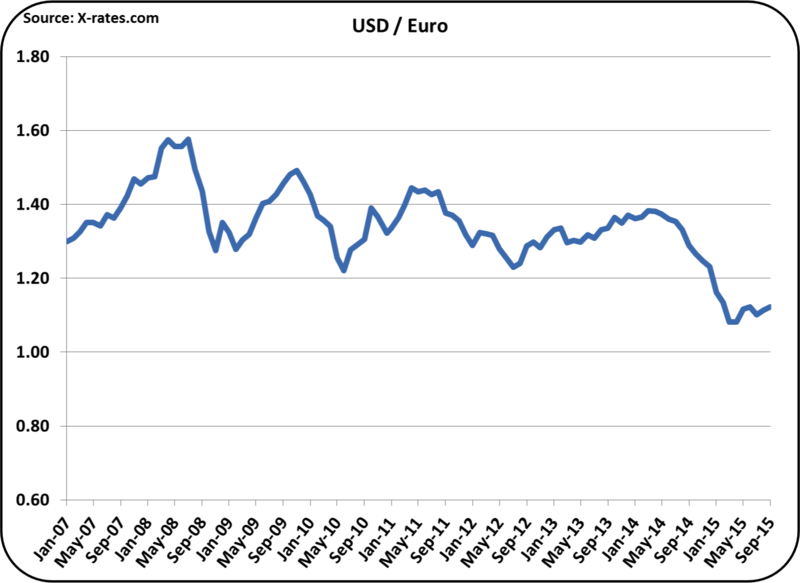 The USD/Euro exchange has now stabilized and is showing signs of a strengthening Euro. However, for now, exchange rates do give the huge European dairy industry a pricing advantage. U.S. imports from New Zealand have increased dramatically. Fonterra, the sales and marketing cooperative of the New Zealand dairy industry has been very effective in promoting New Zealand's dairy products. Fonterra has offices around the world including offices and labs in the U.S. Recently, due to the aggressive growth program supported by Fonterra investments, their credit rating has been downgraded. Regardless, Fonterra is a strong force to be reckoned with internationally. Shown below is the exchange rate between the USD and the NZD. 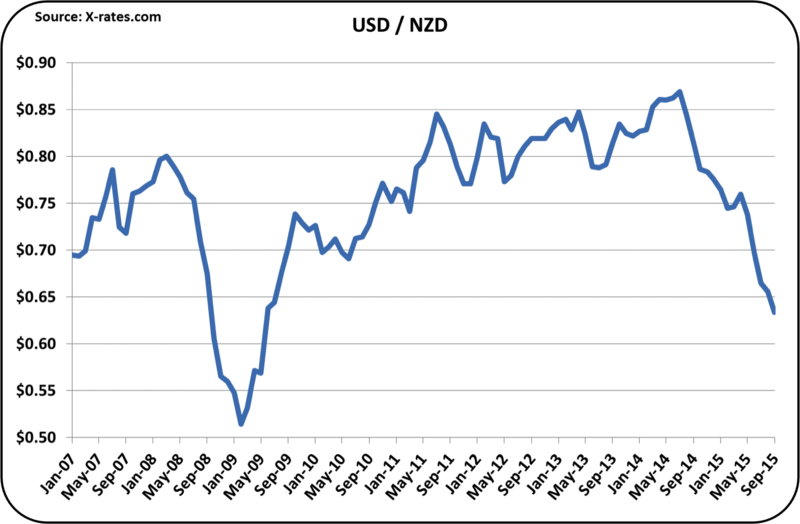 The USD continues to strengthen relatively making the prices for New Zealand dairy products lower on the international markets. Mexico is the largest importer of U.S. dairy products. The NAFTA agreement prevents unfair tariffs and unfair limitations of movement of dairy products between the U.S. and Mexico. Mexico has a cheese deficiency and is by far the U.S.'s best customer for cheese. 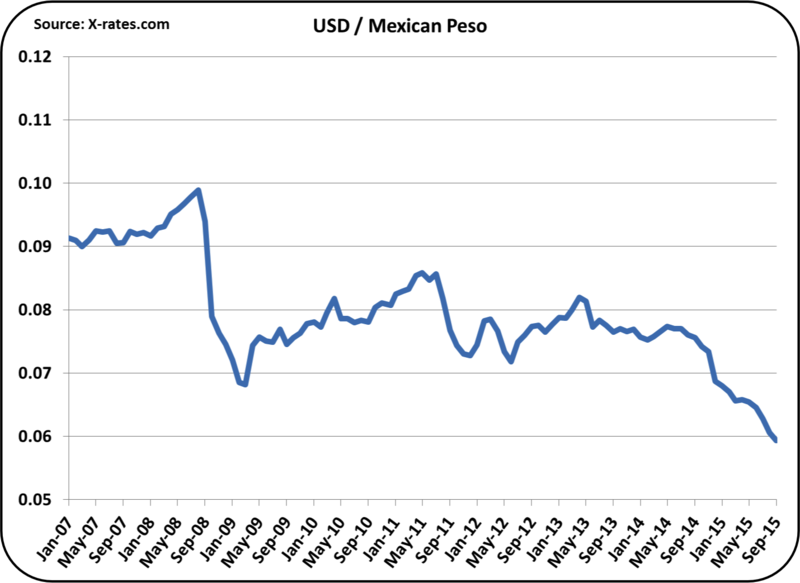 However, exchange rates are increasingly making U.S. dairy products more expensive in Mexico and are making Mexican produced dairy products less costly to import. Mexico does have alternatives sources for unbranded dairy products. Little seems to be happening that could change the export/import picture in the short term. 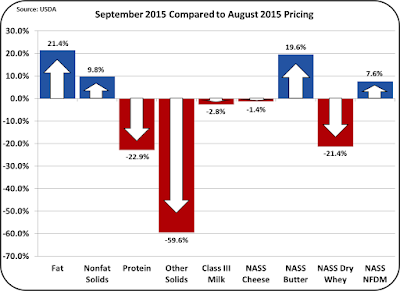 For this reason, U.S. dairy prices are more likely to fall than rise in the next six months. 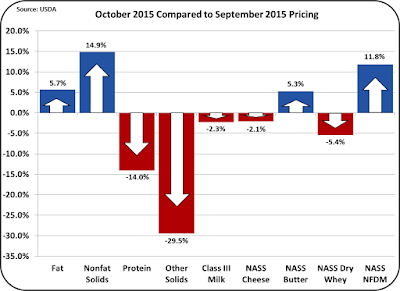 September 2015 Class and Component Prices show significant component pricing volatility. The Class III milk price was down only 2.8% to $15.82/cwt. 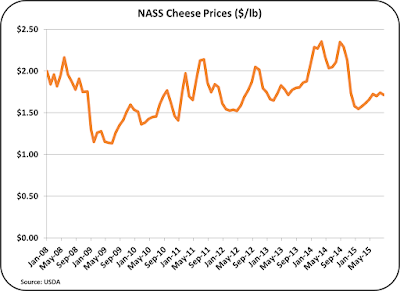 on relatively stable cheese prices. However, the volatility of prices for butterfat and milk protein was very large, with protein down 22.9% and butterfat up 21.4%. This was driven by a huge increase in butter prices, which were already at high prices. Other Solids become almost worthless with a 59.6% plunge to five cents per pound. This has really changed the pie chart of component pricing as shown below. Butterfat contributed 61% of the value to the September Class III price. These prices vary significantly from the long-term trends with butterfat becoming significantly more valuable than milk protein. 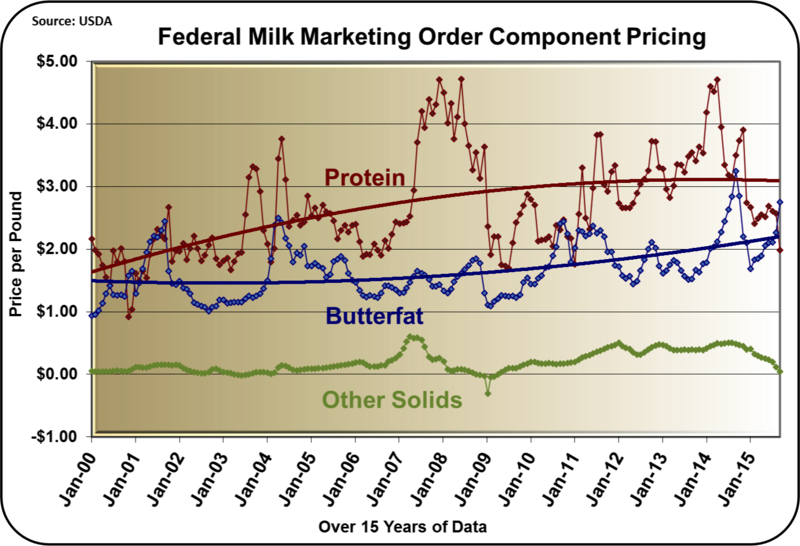 Butterfat was valued at $2.75/lb. and milk protein was valued at $1.98/lb. The high price for butterfat was based on a spike in butter prices to $2.44/lb. The chart below shows the relationship between butter and butterfat prices. 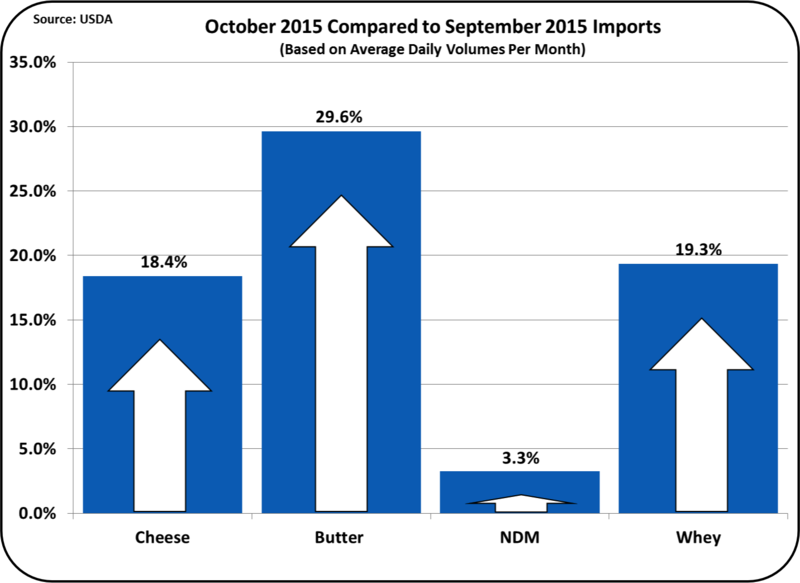 The futures market is currently showing butter prices at $2.57/lb. for October. 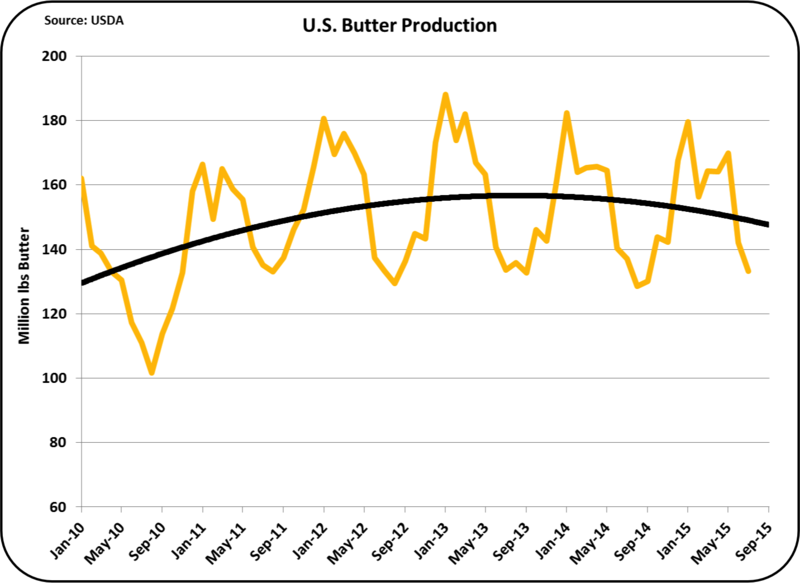 If this figure holds, it would drive butterfat prices to $3.33/lb., the second highest price every recorded. 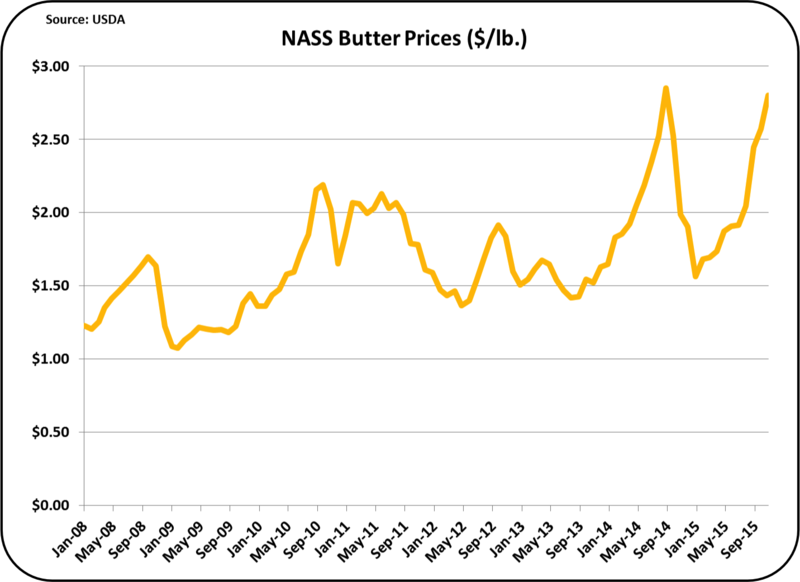 The very high butter price has driven the milk protein price down to $1.98/lb., which is one of the lowest prices seen in the last ten years. 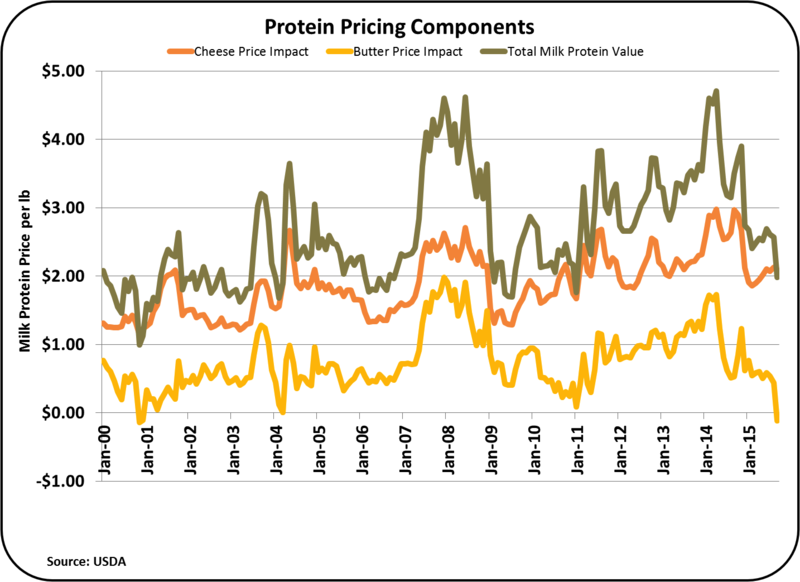 The price of milk protein is driven by two factors; the price of cheese and the price of butter. As cheese goes up in price, the price of milk protein goes up, but the price of butter has an inverse relationship. As the price of butter goes up, the price of milk protein goes down. This formula gives value to milk protein for increasing its value because butterfat is typically more valuable in cheese than in the form of butter. 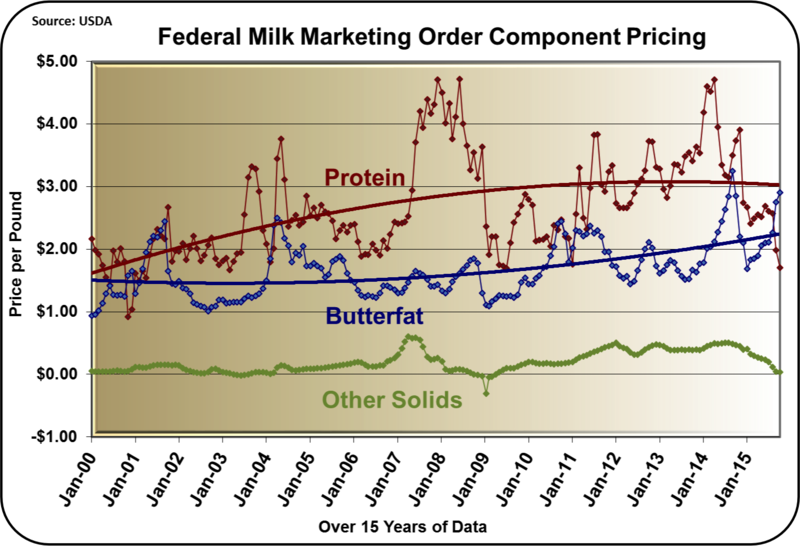 For the first time since 2001, butterfat is currently worth more in the form of butter than cheese as shown in the chart below. 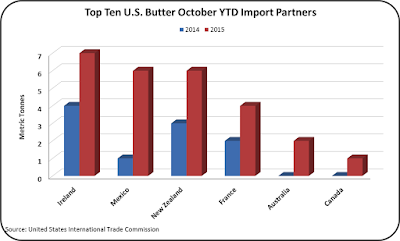 The current U.S. price for butter is nearly twice the international price. 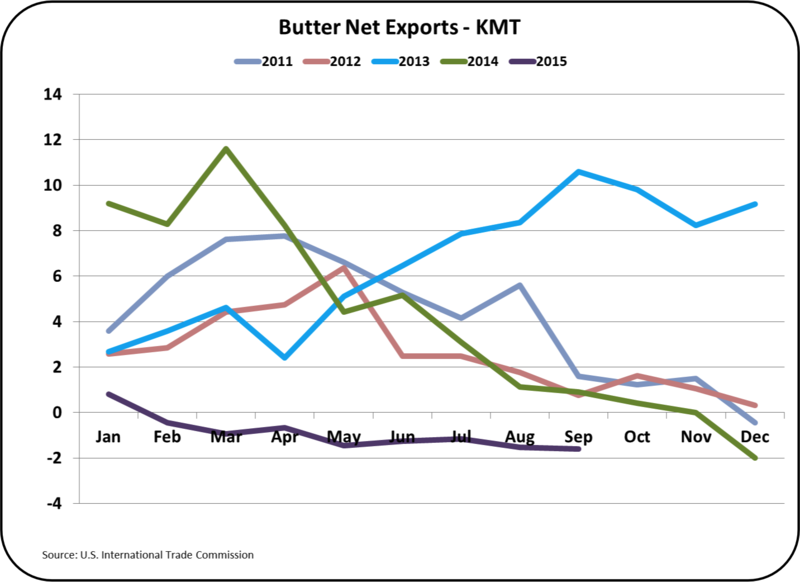 As mentioned in the prior post, the U.S. has become a net butter importer as imports are outweighing exports. Also, over the last three years, butter churning has been decreasing. This has kept butter inventories in line, but there is no inventory scarcity that would typically increase prices to record levels. 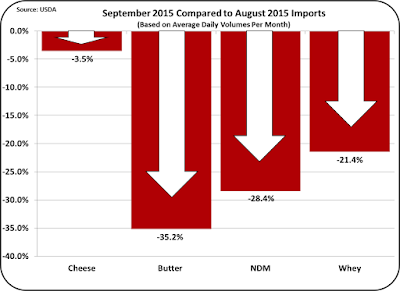 With all these facts in mind, it seems inevitable that butter prices will take a tumble very soon. The futures market is showing a 20% drop by year-end 2015. What is the good news? The most important parameter for the Class III milk price is the price of cheese. At least for now, the price of cheese is holding. 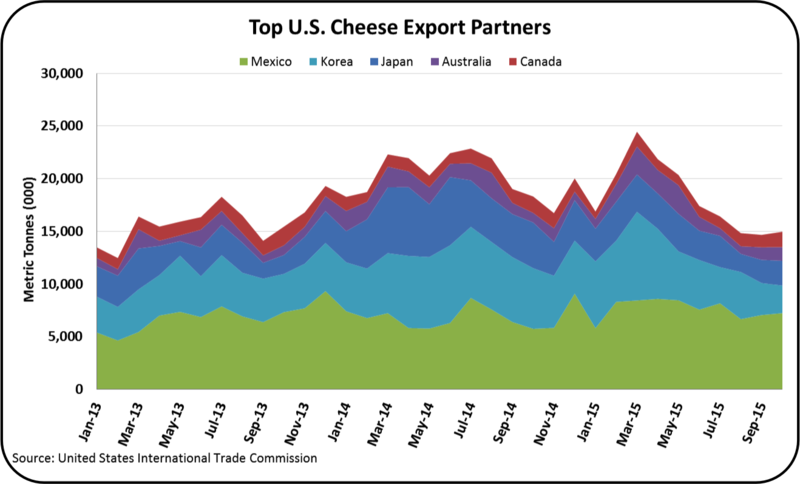 However, as reviewed in the prior post, the U.S. is beginning to see cheese imports increase as less expensive cheese blocks and barrels are available on the international markets. Significant new imports are coming from New Zealand. This is impacting inventories. And, as the inventories rise, price deterioration begins. The futures market is not showing any weakness at this time with stable cheese prices predicted for the next year. This also seems unreasonable as the underlying factors; the Russian embargo on dairy products, lower China dairy purchases, exchange rates, and lifting of the European dairy quotas, show no suggestion of changing. 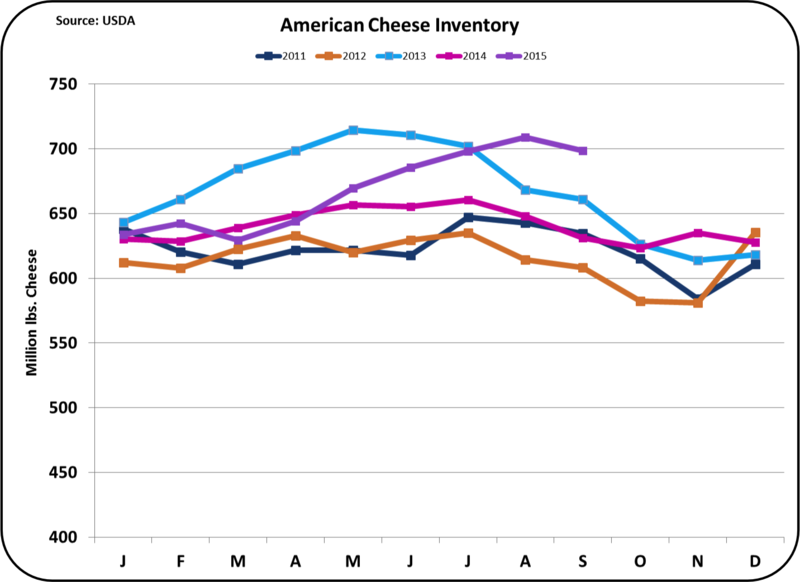 Production of cheese continues to expand in the U.S., but the current rates of growth in production exceeds expected increases in domestic disappearance. 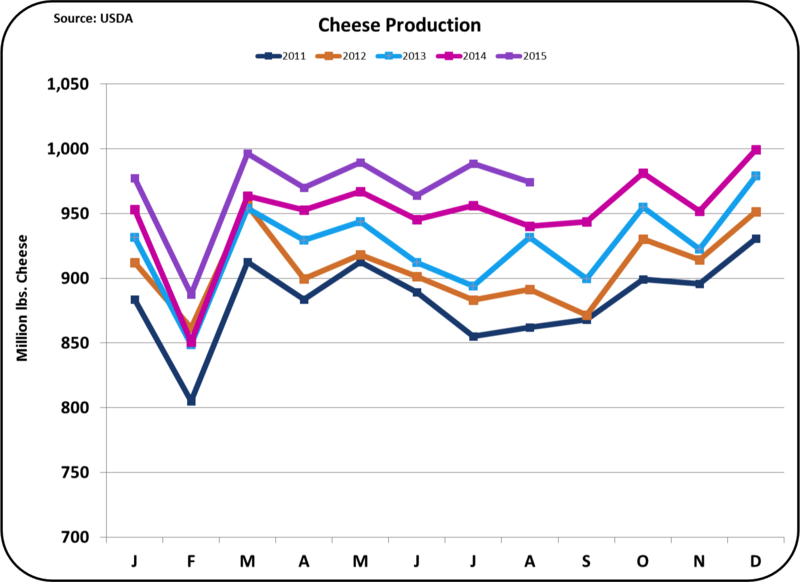 YTD, cheese production is up 2.5% over 2014 and for the month of September production was up 3.5% over the prior year. 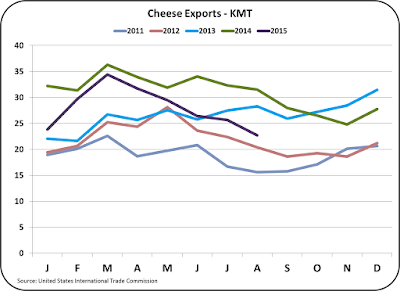 As reviewed in the prior post, cheese exports are down considerably and cheese imports are at record levels for this time of the year. With no change in direction of these analytics, inventories can expect to rise and prices drop. Other solids are valued based on the price of dry whey. Dry whey is an export item. 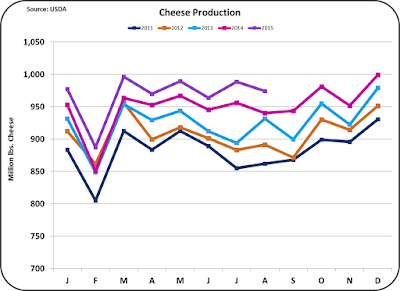 In posts through 2013/4, other solids were identified as a new source of revenue for the dairy producer. Today, other solids are essentially worthless. Other solids were delivering $2 to $3 dollars to the class III price. In September they delivered $.26. The cost to dry whey and package it removes what value there is for dry sweet whey. 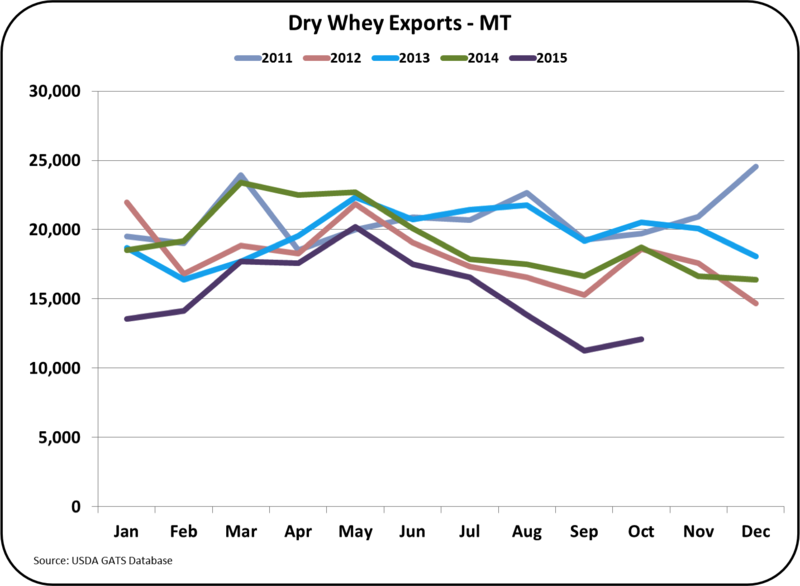 Improved pricing for dry whey will probably be slow and minimal, as global conditions will not quickly change. The items reviewed above include a price bubble for butter, a potential drop in cheese prices, and a sustained lower value for other solids. The most important item for the Class III milk price is the cheese price. Efforts to help maintain the value of the Class III price should focus on cheese. All aspects from production, exports, imports, and domestic consumption can influence the domestic U.S. supply/demand forces.